About Wine 2 Edition ABOUT WINE, 2E is a unique resource designed for those who require practical information on how to manage wine and wine sales for restaurants and the hospitality business. 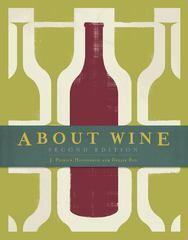 Unlike other books on this subject, ABOUT WINE, 2E first gives readers background information on the origins of wine and how it is produced, and then builds upon this knowledge with information on the wine producing regions of the United States and the World. The numerous variations of wine produced in Europe, North America, and the Southern Hemisphere are presented. Special features include detailed color diagrams and photographs, and useful appendices designed for use as a quick reference or a starting place for more research on topics of interest. This book now includes a new chapter on pairing food and wine and a new chapter on the business of wine and the role of producers, distributors and retailers.